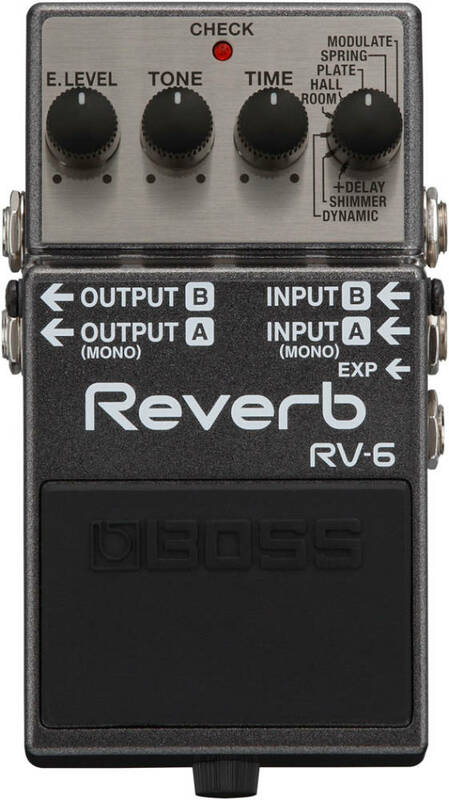 The RV-6 makes getting high-quality reverb sounds with your guitar quick and easyjust select a sound mode, tweak the knobs to taste, and play. But while its operation is simple, the RV-6's sound is rich and sophisticated. Under the hood, each mode includes a huge array of detailed reverb parameters, all perfectly tuned for guitar by the BOSS engineers with direct input from many pro players and sound engineers. Even as you adjust the selected mode with the Time and Tone knobs, many parameters are simultaneously adjusted inside to create the ideal voicing for every setting. My first ever reverb pedal and I enjoy this pedal. I'm not on a particularly big budget so my main tube amp is a silver blues junior from 2013 and the reverb in the amp seemed to have broke. There is still a faint reverb but it does not sound as good as when I bought the amp and is really faint, so I was in need of reverb and was looking for option with more than one type of verb. I own one of those zoom ms50g pedals and the reverbs on it are not terrible but that pedal also broke on me so I decided I needed something quality and boss has always delivered in the area. Sure it is not "boutique" but it is a great pedal with lots of options to fit what you want. I really enjoy the reverb and delay option and the spring reverb setting is pretty good. Still tinkering with it and having fun doing so. I have no doubt this pedal will last , as BOSS products are solid in my personal experiences. I would recommend this pedal to beginners looking for their first reverb option as it is easy to dial in your sounds. I am happy and thats good enough for me. Used to have an RV2 from around 1990. It was the first Boss reverb pedal and sounded awesome until I lost it at a gig somehow years ago. Trying to find another is like finding a needle in a haystack. So I rented a reverb pedal. L&M had the RV5 and 6 on its rentals, so I picked the 6. Not a lot you can do to improve reverbs as this has a shimmer and dynamic settings that are just icing on the cake and its not something you would just leave on all the time. I don't remember my old RV2 having spring reverb so thats nice. After getting back into pedals after having a modeling amp with built in effects, I needed to find a reverb pedal that was easy to tweak. I also needed a better reverb than what I had in my amp, a Marshall DSL40 which when turned up was still barely there. 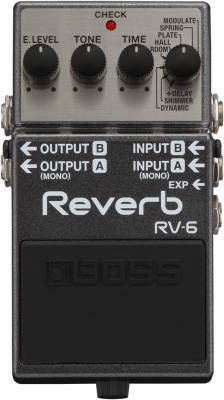 I had a Boss Reverb, a long discontinued RV2 or 3 which I had for years. The early models had reverb/ delay settings which came in handy if you had a delay pedal already but wanted even thicker delay sounds. There was room and hall settings as well but too many delay settings. Then the RV5 came out and it had eliminated delay settings entirely but introduced plate, modulation and gate settings. I almost got that but tried the newly introduced RV6. It has the best of the RV5 settings but has a spring reverb, dynamic and shimmer settings and a delay/ reverb. The dynamic is supposed to adjust the reverb depth as you pick but its hardly noticeable. The shimmer is somewhat like the Eventide Crystals pitch shift setting but really only useful for ambient sounds. Its strength that made me get it is the delay/reverb setting being brought back and the Fender like spring reverb. The usual deeper room and hall reverbs are still there and work brilliantly. A few too many bells and whistles overall but at least the new RV6 incorporates the best of everything from past pedals. The RV-6 is a big step up from their previous model. It has the quality Boss sound with the unique features that make the pedal worth it. I was a bit disappointed with the shimmer function, as it doesn't so much reverb, but more adds the pad sound in the background, which if not used properly can be obnoxious. Otherwise, great pedal! 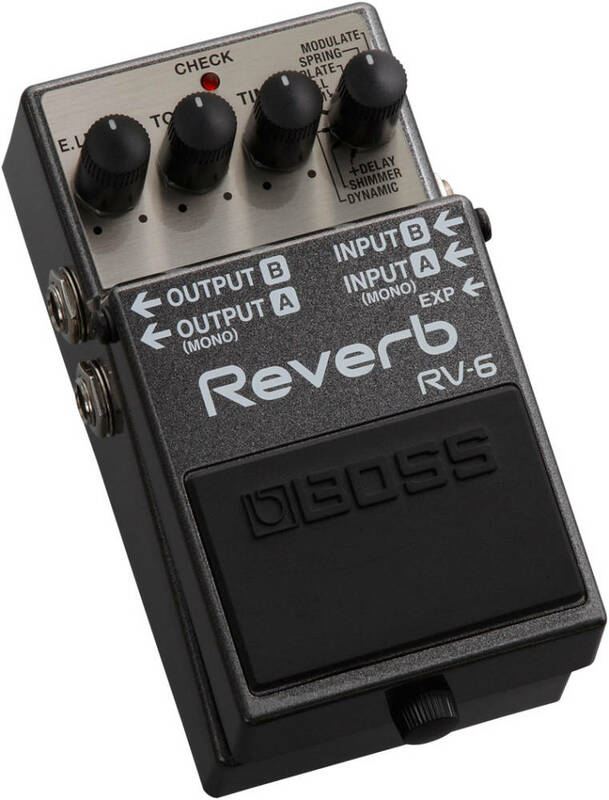 As you can expect from Boss' reverb, it'll be a solid sound with minimal tone leakage. I'm not totally convinced it's an upgrade from the RV-5 as the sounds are minimally different. I find the RV-6 to be slightly brighter. the Mod mode, which I use most frequently, is still stellar and can't be beat. With a few more bells and whistles included such as the Delay+verb you're getting the best Boss can do to keep within the Reverb competition, especially with Strymon continuing to gain momentum.